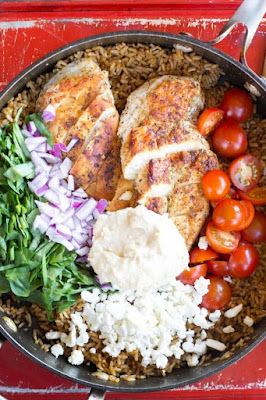 I absolutely love Mediterranean flavors like what’s in this One Pot Greek Chicken and Rice recipe! This Greek recipe is an easy dish to make and cleanup couldn’t be simpler with it made in just one pot. Like many recipes I create, they need to be easy – some may even be semi-homemade! Trim and season both sides of the chicken breasts. Pour a tablespoon of oil into a medium size pan (pick one that has a lid). Use a paper towel to evenly coat the pan. Warm the skillet over medium-low heat until the pan is hot. Add the chicken and cook 3-4 minutes or until the sides of the chicken start to turn white. Flip chicken over and squeeze half the lemon over the top of each chicken breast. Cover pan with lid and cook for another 3-4 minutes or until the internal temperature reaches 165. Remove chicken from the pan and set aside. Squeeze the rest of the lemon into the pan and pour in broth. Bring to a simmer and add rice. Reduce heat and cover. Cook for 5 minutes. Once the rice is done, turn off the heat and let sit covered for another 5 minutes. Chop spinach, onions, and tomatoes. Slice chicken diagonally. Remove lid and layer chicken, spinach, onions, feta and tomatoes. Top with hummus and serve with pitas. For dressing, mix ½ cup oil, 1/3 cup red wine vinegar, 1 T lemon juice, 1 t maple syrup and ½ t Greek seasoning in a jar. Pour over the top of dish before serving or serve on the side. 0 Response to "ONE POT GREEK CHICKEN AND RICE"